S.Phillips Window Cleaning Company Limited Spotless service, guaranteed! Leading Window Cleaners in Christchurch, Bournemouth, Poole, Highcliffe, New Milton, Lymington and the surrounding areas. We don't just perfessionally clean windows we also offer other services. We clean carpets using the highest quality machine and products. A fully trained and experiance technician can help make your carpets look as good as new! With an extensive experience of window cleaning, we offer many other services. S.Phillips is a friendly, reliable and professional service striving for 100% customer satisfaction. A trustworthy company, we clean windows to the highest quality, making sure that the customer is happy and we go the extra mile to provide that high quality service. REQUEST A CALL BACK. Please enter your details below to request a call back from one of our team. Friendly, Reliable, Professional Service for 100% customer satisfactory. A very trustworthy company and we clean windows to the highest quality. 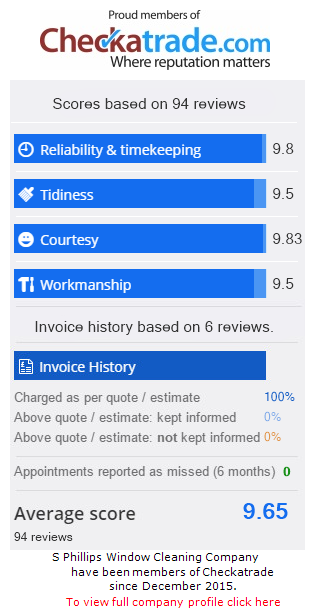 We make sure that the customer is happy and will go the extra mile to help. We don't just clean glass on its own we clean window frames and sills on every clean. Sam gives a very friendly, reliable service with sparkling results every time. Please use the comment box for references only. If you would like a price quotation please go to “contact us” page on this website. Very Pleased With S.Phillips Window Cleaning. He was very professional and he explain the whole water fed pole system to me. I used to have a traditional service but I can't believe on how much more cleaner my windows are. Thank you team. I had my windows cleaned in the rain this morning and I questioned about the rain guarantee. The window cleaners said that if I'm not with the finished result then to call them and they will come back to re-clean the affected windows. I really can't believe the results now it has stop raining. I don't really understand it but I don't need to call them back. Many thanks truly a brilliant finish and the services is highly recommended. S.Phillips cleaned our carpets over the weekend and now they are clean they are as good as new. I was unsure whether I should have them cleaned professionally or hire the equipment and clean myself but I'm really glad I didn't! The guys were very knowledgeable and they were able to remove the stains that I had in my carpet. Really good price considering that they were here for a good length of time. I have booked them in again for other parts of my house to clean the carpets. Our neighbour had there carpets cleaned also by S.Phillips and they are so pleased with the finished result. A trustworthy company and would recommend. Many thanks. Had S.Phillips Window Cleaners round for a price quotation. I can honestly say that the staff was really helpful and amazing value for money. They did a brilliant job and would recommend them to all my family and friends. We found S.Phillips Window Cleaning on the internet and we thought that we would give them a try. Very impressed on the cleaning method, much better than the old traditional method and quality was brilliant. The guys were very friendly and polite. We only wanted a one off clean but because the price was right we are having the service regular. Thank you for your quality cleaning!